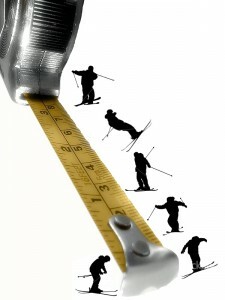 How should we measure skiing? 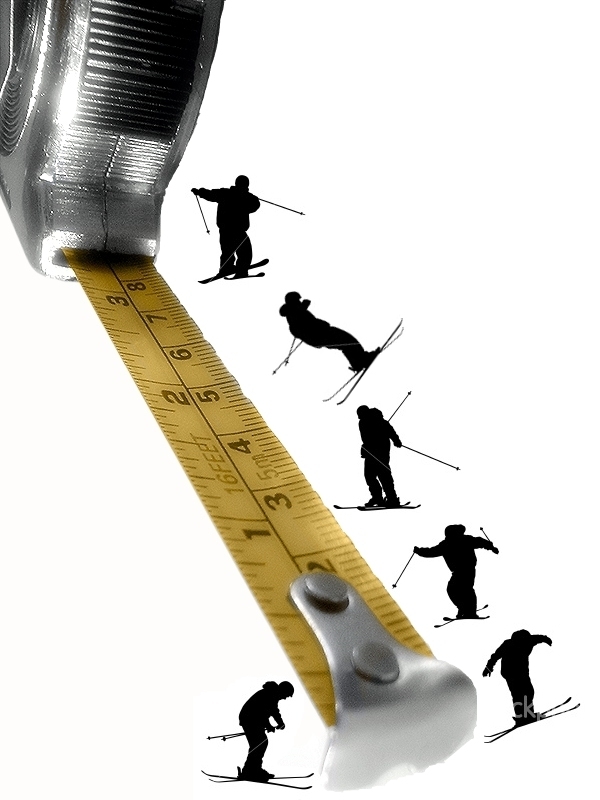 This is where the matter becomes tricky, because without some kind of ski-meter attached to the skis, how can we measure the daily dose of skiing? Europeans might be “measuring” their ski areas the right way; they don’t use skiable acreage, but “miles of ski runs” instead. It’s not uncommon to see some of their largest ski areas boast “50 miles of runs” or something like that. While this is a precise measurement, it doesn’t say much about slope and snow conditions and there could be some enormous difference between one mile of “green,” beginner run, and just one-tenth of a mile of “black diamond” chute! With the limitations of this linear measurement, there ought to be a better yardstick that relates to the total energy expended by the skier and this might be vertical drop. “Vertical drop” is simply the measure of how tall a ski hill is; if the elevation at the top of the gondola is 7,950 feet and its base is 6,570 feet, the vertical rise is 1,380 feet. This measurement implies more than just a fixed distance but a variety of options to descend that hill. It could be a gentle slope or a more intimidating expert run blending mileage and difficulty in opposite proportions. The next logical thought would be “how much ‘vertical’ can be skied in one day?” Another loaded question, because it depends on the skier’s ability, the type of lift used, the steepness of the slope and both snow and terrain conditions. For some, 15,000 feet means a full day while for others it might be 30,000 or even more. If you’re worried about keeping track of all these numbers, there are even tools available, like high-tech wrist watches that will do the computing for you! Modern infrastructure makes a big difference too; do you remember the old days when riding up a lift took forever? It wasn’t unusual that ninety-percent of ski time would be consumed riding up the mountain. This isn’t the case anymore, particularly in Deer Valley, where the vast majority of lifts are now high speed chairs and a gondola. Some actually stand out so much that “vertical skiing” records were broken just this year, with over 115,000 vertical feet tallied in just one day, most of it on “Sultan Express,” breaking a previous 108,000 feet record set back in 2007, in nearby Snowbird! 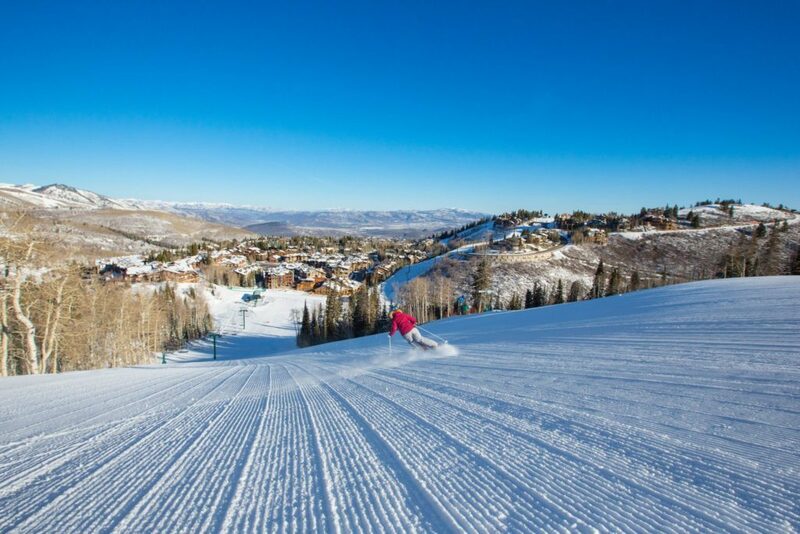 There are in fact very few ski-lifts, the world over, that come close to Deer Valley’s “mighty” chairlifts. Of course, you can always find a steep slope and hire a helicopter, but this can be outrageously expensive, not counting the “carbon footprint” consequences… All this means that with lifts like Sultan, Lady Morgan, Sterling or Wasatch, among many, Deer Valley Resort makes it possible to get a full ski day within a few hours, as long as you are in shape, can time your outing while other skiers have lunch and pick well-groomed runs. With all the extra time left from your “compressed skiing-time,” you’ll be able to catch up with your work, go shopping, enjoy more après-ski time and indulge on a leisurely dinner. But again, that’s all about quantity and never forget that quality of skiing is job-one, long before considering metering everything in your skiing life! NO. Consistent vertical drop is HOW MUCH I CAN SKI FROM TOP TO BOTTOM. That’s the given among skiers. Deer Valley is off that number by 1000 feet. That’s misleading. Anyone can ski ONE run top to bottom and call it the most vertical feet, Snowbird, Jackson. What really takes skill and endurance is vertical feet in a day.. 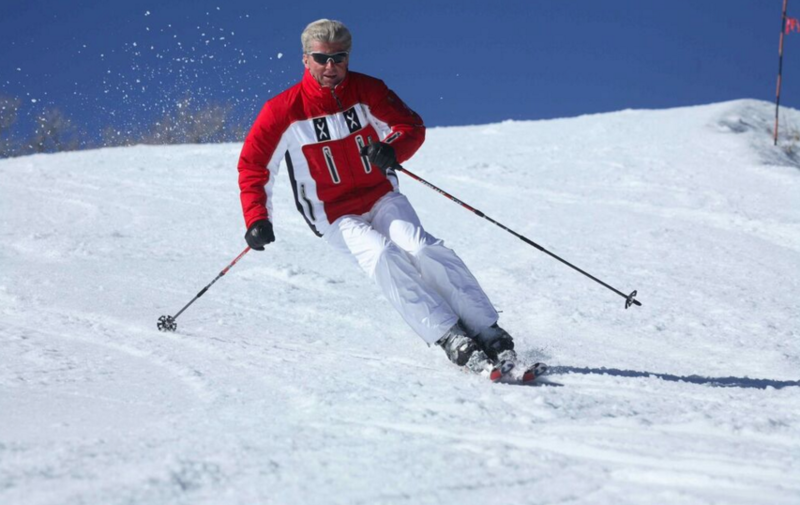 I have skied 70 days a year for over 38 years, all over the country. I race in the Masters so I get around. Deer Valley is the only resort you can get over 100,000 vert a day consistently There are no lines, no people and no snow cops on Sultan. I track my vertical every day with my GPS. I dare anyone to say they can do it at the ‘Bird or Jackson, while they wait in line for the tram. Any skier needs to rest the quads on the chair, Try that standing on a tram. Sorry Pauly, not even close. Most days on the Sultan Express you can average approximately 6 runs an hour at 1740 vertical feet per run. The chair is normally set at 830 or so and takes about 6 minutes from bottom to top. A run will take 2 to 3 minutes depending on the conditions. If you were to ski it for the full seven hours you would end up with approximately 73,080 vertical feet. It would not be possible to reach 100,000 vertical feet in a day with the aforementioned scenario. 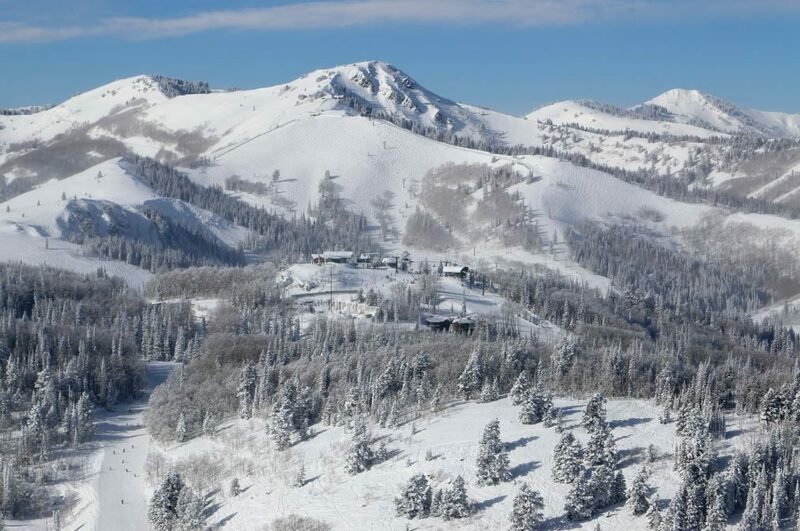 I skied more than 100 days at Deer Valley this ski season (2012/2013) and currently have 3.2 million vertical feet logged for the season. I used AlpineReplay (http://www.alpinereplay.com) to track my ski statistics this season. Went to Sun Valley and had my ski tracks on. Skied almost 19 miles, but the vertical feet was about 25,500 feet and the total runs was 12. Could someone tell me the diffence in vertical feet vs. miles skied. Thanks, Woody. Hello Woody, Vertical Feet is in reference to your starting elevation on the mountain and your ending elevation. So if the chairlift drops you off at 10,000 feet and you ski back to the chairlift at 9,000 feet that would be 1,000 vertical feet skied. The miles tracked is how far you actually skied. Does that help?